A reader noticed an outlet above the front door that is on a ledge wall . . .
and wondered what I used it for. I had the builder place an outlet on that ledge for placing lighted Christmas decor on that ledge. However, other than previous Christmas decor the ledge has been empty. I just never found the right things to place up there that wouldn’t seem lost . . .
as the ceilings in this room are 24 feet high. Until this weekend . . . I added large vintage baskets. I had two of these baskets for a while and they were recently in the attic. The third one I purchased at an estate sale. Total costs for these three vintage baskets were $45.00 . . . Yes, $45.00, it’s not a typo! The rectangular basket was purchased at an antique mall in Tennessee. much she wanted for the basket as it was yet to be tagged, she replied, “is $10.00 OK?” Why of course!! The small round basket discovered at an estate sale in a corner with Christmas bows in it, marked $5.00. Left the bows . . . just took the basket! I do love the baskets on the ledge. It created one problem though . . . I am on the hunt for more large baskets! I do have one other larger basket, my French gathering basket. . .
however, I love it just where it is, next to my French Buffet! Have a wonderful day, with most of you enjoying a day off from school or work for Presidents’ Day. I must admit I took advantage of a sale yesterday! . . . No venturing out today as snow is predicted! 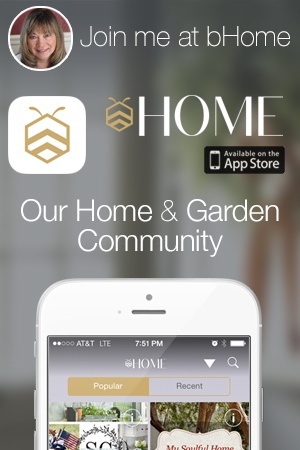 If you have not already checked out the fabulous new all things home and garden app called bHome. . .
All things home and garden at your fingertips on your mobile phone or iPad. It can’t get any better than that!! It launched so very successfully last week! Just click on the bHome badge below or on my sidebar and start having fun! I love those there and I am sure someone had fun placing those up there. you should look at cost plus world market. they have some cool baskets. Very nice!! I do love baskets too and use them everywhere that I can. My daughter used to be a Longaberger consultant so you can imagine what I used to get as gifts. Love the look, Shirley, but I wonder how many tries it took to get the vignette just right – you know how that goes, just a tweak here, no there? At that height, and knowing the down staircase was right behind me, I think it’d give me the willies! 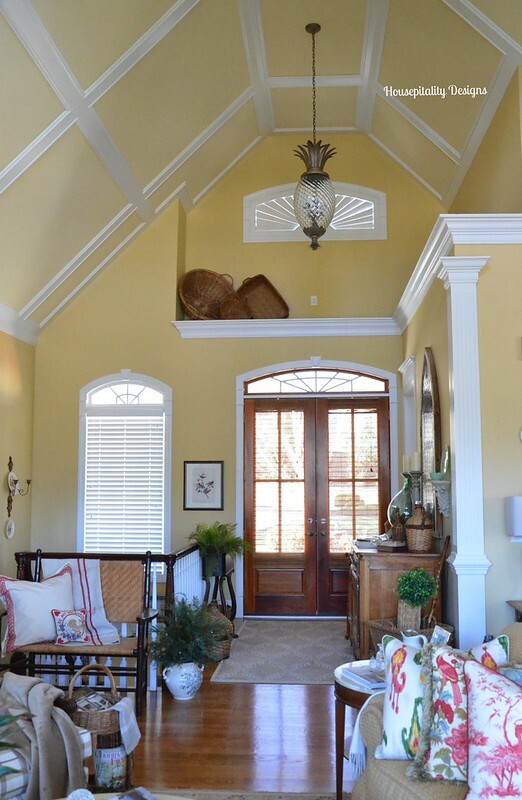 Love those yellow walls too. Btw, I also absolutely love how you trimmed your wreath into a heart – that was genius, really. Now, do you have plans to make a shamrock too? Snow is coming down here, ugh, and we’re expecting 6-10″, double ugh. How much are you expecting? Spring, come soon! Stay safe. Looks very nice. Now, how do you plan on using the outlet with them?! Looks nice and so smart to have an outlet up in that area. – Brilliant! The baskets look fabulous on the ledge. Love them. The baskets look great there! It’s fun to have something special to shop for when antiquing. We are getting snow today as well. It hasn’t started yet, but it is suppose to around noon. Then tonight they are calling for freezing rain…booo! Love the baskets up on the ledge!!!! It will be fun to hunt for more while out and about. Have a great week!!! Your baskets look great on the ledge good luck in you hunt for more. Beautiful!!! I have several large baskets too and all are paced around except one, that I am still looking for the RIGHT spot:) Beautiful baskets. I had a client who had a similiar set up and put a fountain up there!!! Those baskets are perfect in that spot, Shirley. 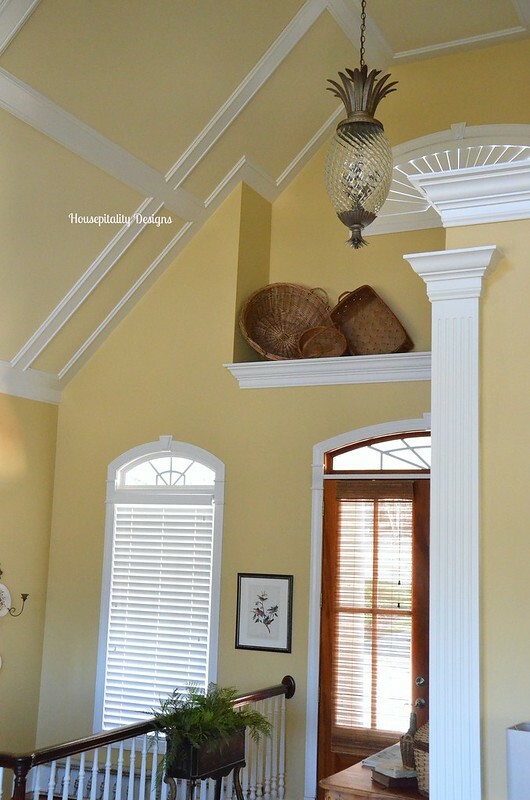 Looks nice, but I would either put another basket to hide the outlet, or paint the outlet the wall color,…or have an electrician put the outlet in the shelf instead of the wall! I’d put some kind of decorative lighting up there on a timer, so it is illuminated at night….so you can take full advantage of that outlet during the year, and not just at the holidays. I’m just full of ideas for other people’s homes! Oh, how I love baskets to make a room all cozy, just like you have done. And yes, you got those three just right and cannot imagine doing it on a ladder! Hands are sweating as I even type that. You may want to paint the outlet the same color as the wall, as I know you love going up and down that ladder! Love what you have created Shirley. 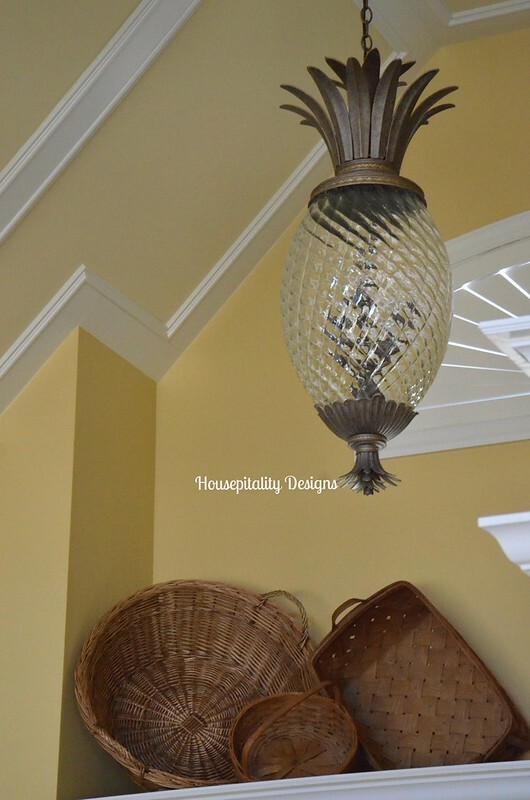 Simple, classic and baskets make wonderful decor! Beautiful setting but what caught my eye is that awesome pineapple light-I love pineapples (hospitality) and crocheted a pineapple doily last year. Hi Shirley, Love your ledge and the addition of the baskets. They really stand out against your wall color. I have 5 of these very high ledges in my home and they have been so much fun to decorate. I have one with an outlet too and a window like a little room up high. Love your pineapple hanging chandy too. Your home is gorgeous. The vintage baskets look great! High ledges can be such a challenge to style; you solved this challenge beautifully! 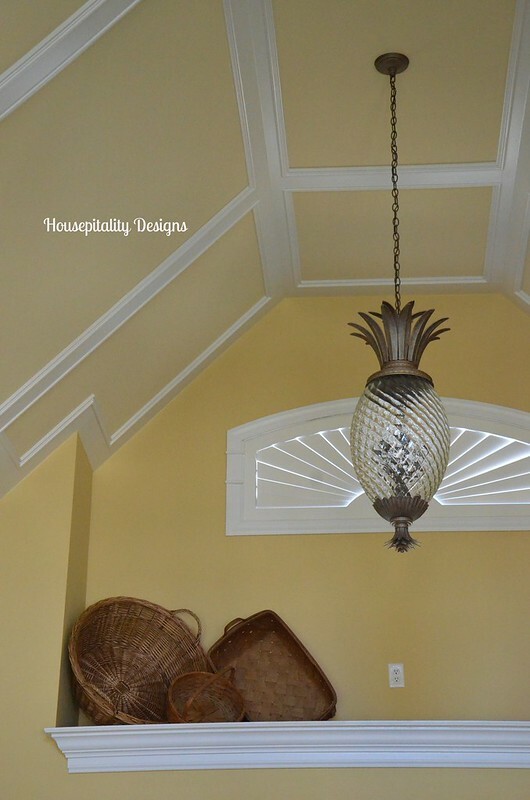 Your ceiling, ledge and pineapple chandelier look marvelous! I have a tall ledge where I put baskets, too! I love the way you nestled yours together, the start of a fun collection. The basket looks great up on the ledge and a few more would be perfect. Hopefully you will find more on your treasure hunts. See that you are having terrible weather there. Be safe and stay warm. LOVE you ledge. I think so may people overdo an area like that. YOU NAILED IT!!! YEA for Housepitality Designs on bHome!!!! What a nice finishing touch to a troublesome area! What a perfect way to style the ledge. 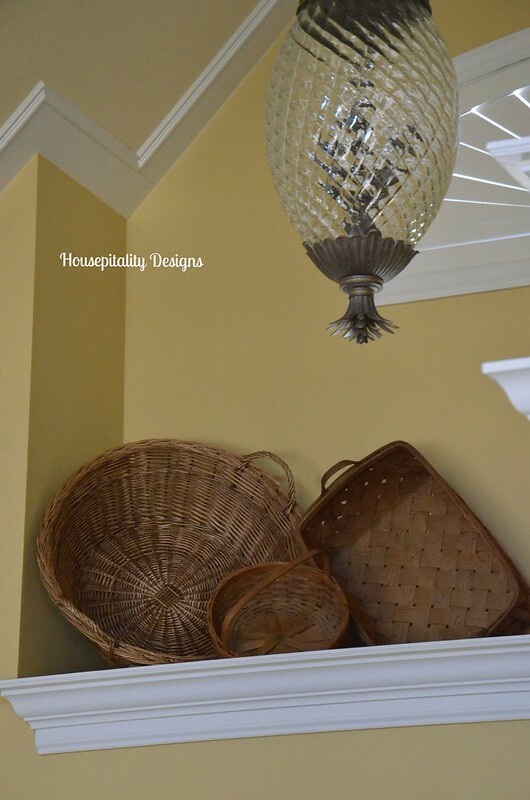 Baskets are a favorite of mine especially for the texture they bring to the space…gorgeous! Looks great, Shirley, and you can never have too many big baskets. I hope you guys are staying warm! I LOVE the way those pretty baskets look up there Shirley! Great idea! !